surrounding landscape. 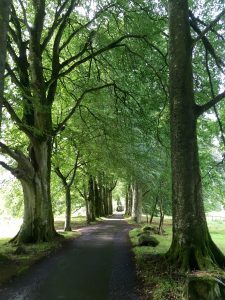 This is the driveway to Drummond Castle, near Criefff in Perthshire. 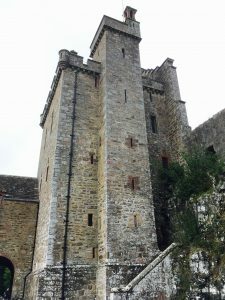 We swooped in like bats and burst out at the far end by a tower house settled on a rock, commanding the land around. 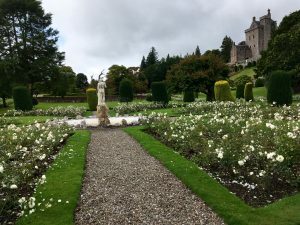 From here the garden falls off a terrace and down a slope bristling with statues and stone work and into a topiary garden of patterns of beds and very many clipped trees and shrubs. There are grottoes and ponds and giant radial beds where hybrid teas – one cultivar per bed – flower their hearts out. 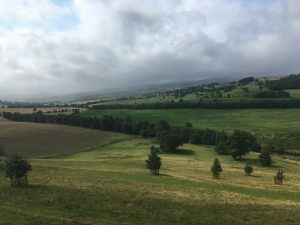 I have never seen so much Stachys byzantina and Anaphalis triplinervis in one gathering but that is to do with making a giant saltire – the flag of Scotland. Bed edges are drilled to perfection. All is so neat. The statues look a little saucy, even rude in amongst all that clipped precision. Beyond the formal garden, the slope opposite has splendid woodland trees – a great contrast with all the topiarised specimens in the garden. That apart, Drummond is an introverted garden. My dream would take me back in a snowstorm or when the place is wreathed and muffled in mist. 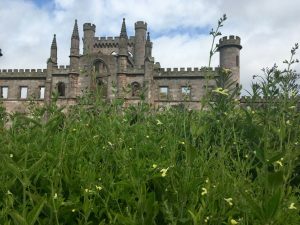 Lowther Castle is near Penrith. The building, now a ruin, is of very graceful early 19c construction of the Strawberry Hill Gothic type. Step inside and the building suddenly grows and dwarfs you. 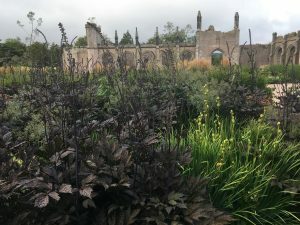 For mood, theplanting is beginning, as intended, to run away with itself across the floors of former halls, and billiard rooms and up the walls. This is not dereliction but a sensitive vegetative recasting of purpose. 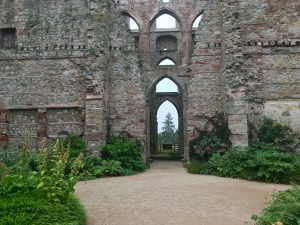 I read that it was an utterly gloomy place but now the first phase of planting has been done, it has visitors losing themselves in the grounds and hurrying along paths to explore the stones and spaces of former gardens that might have rivalled Drummond for immaculate maintenance. These good old bones are being slowly revealed and cleared of trees and brambles. A terrace on the west side dates from the 17th century. It is big enough to drive coach and horses along and no doubt many did in order to see the view out over the Lake District. 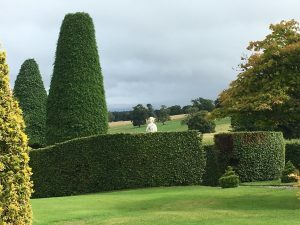 The grounds of Lowther are a garden on the remake : both energetic and atmospheric. I loved reading that volunteers came in droves last October to plant sacks and sacks of thousands of bulbs.